Light is something that most people take so much for granted, that we hardly give it a second thought. Nowadays most of our houses are lit by electricity, but not long ago people relied on gas, oil, and candle power for artificial light. The need for light is fundamental. There can be no life without light. It will come as no surprise, then, to learn that images of light and darkness recur throughout the Bible. In the New Testament too, light is a key image. The Gospel according to St. John describes Our Lord as "the light." Not the light created by God, but the Creator Himself! Our Lord, too, uses the image of light to teach His disciples, when He says that we should shine as lights exposed on hilltops, and not hide our faith under buckets. A Pascal Candle can be found in most churches, and it is easy to identify. 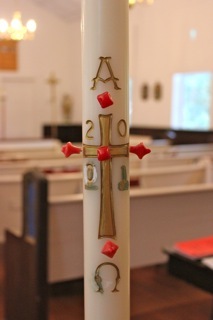 It could well be taller and fatter than any other candle in the church, but it is certain to be the only candle to be decorated either with a decal or by being painted. 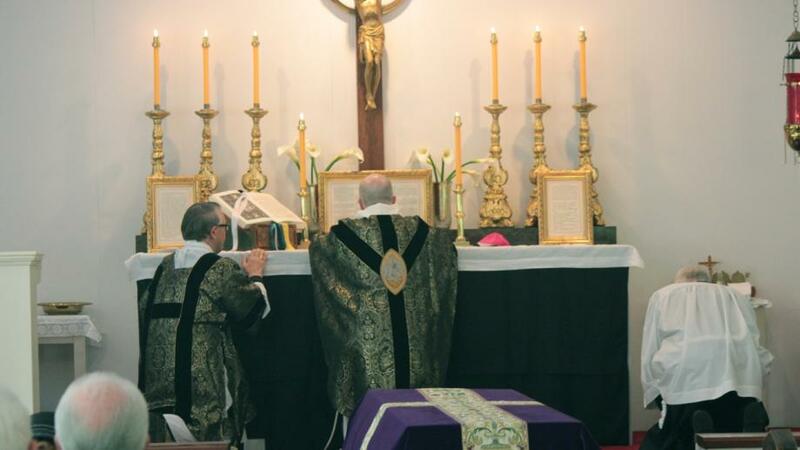 From Easter to Pentecost, or Whitsunday, it will be in a prominent position in the Sanctuary near the High Altar. The Pascal Candle is named after the PASCH, the passion, death and resurrection of the Lord. The candle is blessed at the Easter Vigil ceremonies, and represents Christ the light of the world. The Easter Vigil includes the first Eucharist of Easter, and is a dramatic re- presentation of the mysteries of creation and redemption. It begins in total darkness, but ends in a flood of candle-lit glory! 1. Immediately after lighting, the Pascal Candle is carried in procession through the darkened church. As the Pascal Candle approaches the Choir, the ministers and congregation in turn light candles they are holding from the Pascal Candle, and from each other. This is a powerful image of the way in which we come to share in the living light of Christ, and also spread that light throughout the world. 2. Towards the end of the Vigil, before the Eucharist, the Pascal Candle is taken in procession to the font. There, using the candle as a symbol of Christ, waters of Baptism are blessed as the candle is dipped three times into the font. This reminds us that in Baptism we enter into the tomb of death with Christ, only to rise again with Him, whose Resurrection we are about to celebrate. 3. After Pentecost the Pascal Candle is kept in the Baptistry for use during Baptism. Altar Candles and Processional Lights The number of candles used to decorate altars can vary, but traditionally they are in combinations of two, four and six. A useful rule of thumb is that the more candles, the more important the altar is likely to be. Side and Lady Chapel altars normally have two, or sometimes four candles (two being lit for low mass, all four only being lit on high feast days). The High Altar would have anything up to six candles (seven when a bishop is present). The more obvious symbolism is that the altar represents the throne of God, from which the light of Christ shines upon His gathered people. You may also find it helpful to meditate upon what the number and arrangement of the candles might suggest. Candles carried in procession are a simple, but effective way of honoring both the cross which they accompany, and also the priest as he represents the person of Christ. Their use adds both dignity and color to the Church's worship. Many priests in the Anglican Catholic Church present a lighted candle to the newly baptized person at a certain point during the rite. Before the service begins the Pascal Candle should be lit, and the baptismal candle is lit from this. The symbolism demonstrates clearly that, through the Rite of Baptism, the newly baptized person shares in the life of the Risen Lord, represented by the Pascal Candle. The words which accompany the giving of the candle can also point out an important meaning: "Receive the light of Christ, that when the bridegroom cometh thou mayest go forth with all the Saints to meet Him ... "
You may be fortunate enough to worship in a church which has a PRICKET STAND or a stand for holding VOTIVE or prayer candles. If you do, or when you go into a church that does, one will usually be found near a statue/shrine of a Saint or near to the Reserved Sacrament. Lighting a candle in prayer is a powerful symbol, full of meanings. 1. The lit candle reminds us of our Baptism, and the way that we share in the life of Christ by sharing in the life of the Church. When we go, leaving the burning candle behind, we are reminded that our souls never leave the presence of God, in company with His Saints. 2. Prayer is not self-centered, it is God centered, and an important element is prayer for other people and causes. When lighting your candle, it is a very good idea to light a candle for those others you want to pray for. The candle will not be a substitute for the prayer of your heart, but an accompaniment. A small offering which, in honoring the Saint and giving glory to God, speaks both from the heart and to the heart. 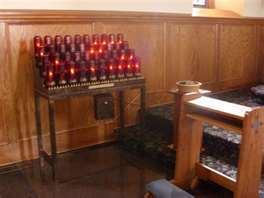 Lighting votive candles in church, when asking the prayers of the Saints and thereby to the greater glory of God, is growing in popularity in the Anglican Catholic Church. It is a devotional practice in which many millions of Christians the world over have found inspiration.